Wool in a suet cage with some rocks for weight attached to a rope then wool flung around by drill. A suet cage? They lock suet up? Is it traditional or something? 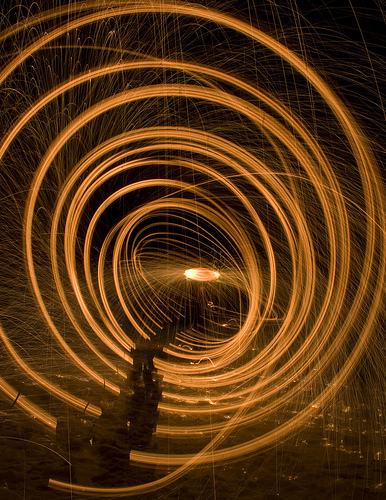 The steel wool physiogram is a thing that I suspect many have tried, (I know I have) but few, if any have succeeded. You know it would look completely mental if it worked. I heard a physiogram get mentioned then! Definitely looks like one especially with that spin in the centre. I guess that makes it spun wool. how could you handle the sharpness of the lens over all layers deep in the picture…. ? Thanks for posting the video. Love seeing how some of these things are made. Nice! Now I know what to do with that rusty suet cage in the backyard! f/18 should be the reason for focus throughout. Had I have shot this at say f/7, that wouldn’t have been the case. Haha! Ruuuun Tacky ruuuuuun!!!!. 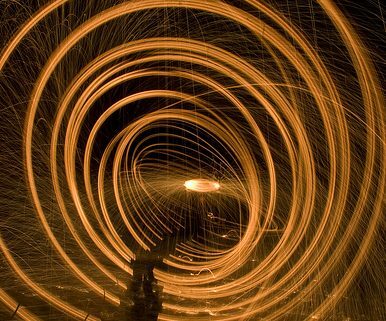 Almost a sparks physiogram!!! Excellent.